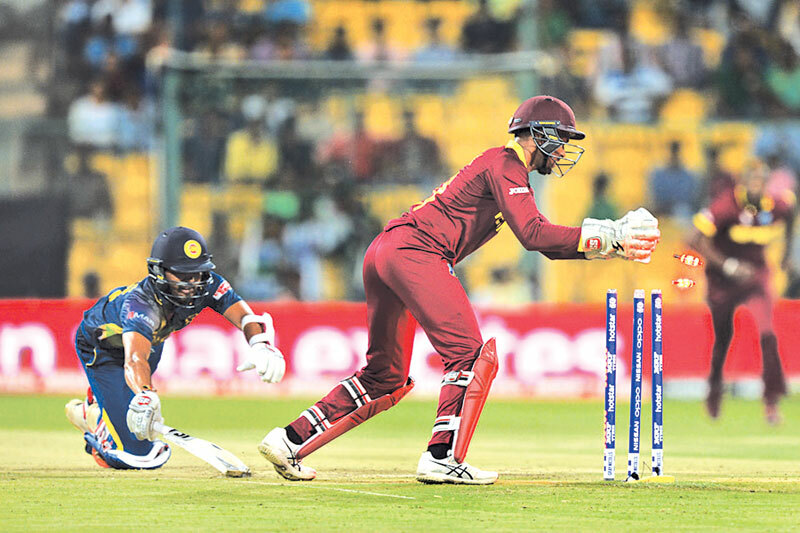 BANGALORE: Another dreadful batting and catching display by Sri Lanka saw them crash to a seven-wicket defeat against former champs West Indies in a Group 1 match of the ICC World T20 at the Chinnaswamy Stadium here on Sunday. Sri Lanka put into bat first could muster only 122-9 against some excellent spin bowling by Samuel Badree and Sulieman Benn who between them sent down eight overs for just 25 runs and three wickets. The West Indies fielding was also outstanding affecting two run outs and cutting out many boundaries that kept the Lankan total pinned down to a minimum. West Indies run chase was led by opener Andre Fletcher who slammed five sixes and six fours as he raced to an unbeaten 84 off 64 balls. Fletcher opened the batting with Johnson Charles after Chris Gayle the local hero was unable to come in his usual position after being off the field for a slight hamstring injury sustained while fielding. Although the chants from the crowd at the fall of every West Indies wicket was for Gayle, the Big Man was never given a chance to make his appearance as man of the match Fletcher and Andre Russell (20 n.o.) steered West Indies home with an unbroken fourth wicket stand of 55 off 33 balls. It was not all plain sailing for the West Indies when they began their run chase as they had difficulty trying to negotiate the leg spin and googlies of Jeffrey Vandersay brought in as replacement to the injured Lasith Malinga. Vandersay was drafted into the side less 12 hours after flying to Bangalore and he didn’t disappoint in his maiden World T20 match finishing with figures of 4-1-11-1. He caused a great deal of uncertainty amongst the West Indies batsmen but once he had finished his quota of overs it was only a matter of time before West Indies knocked the runs off despite losing three wickets in the process. Gayle however didn’t disappoint his fans when he came out after the match to wave to them. Gayle’s absence in the batting line up proved that West Indies are not a one-man show but they have others in the dugout who could also win matches for them. Sri Lanka were not helped by some dubious umpiring decisions that went against them but the manner in which they fumbled on the field – dropping two easy catches, they didn’t deserve to win. Once again it was the Sri Lankan middle order that let them down losing half the side for 47 by the ninth over. Thisara Perera with 40 off 29 balls (1 six, 5 fours) gave the batting some much needed power in the late order that saw them to their final total, but it fell far too short for their bowlers to defend. Sri Lanka captain Angelo Mathews said that they were 20-30 runs short and admitted that they were ‘horrible’ in the field. Sad to say Sri Lanka don’t look like a team that will go a long way in this tournament. It will be a miracle if they make it to the knockout stages of the semi-finals. To do that they will need to beat England and South Africa in their final two group matches – a tall task considering their current form. They are a far cry from the team that won the world T20 title two years ago. The present team lacks any match winners and big names to attract much attention as a contender for the title. In comparison to how the other teams are playing Sri Lanka are lagging far behind, and there are certainly no quick fixes to a team in transition.